So many times after our loved ones return home from the hospital, it becomes obvious how inconvenient and dangerous our homes can be when we care for them. An overbed table is a terrific convenience both for people who must or who simply like to spend long amounts of time in bed. An overbed table provides more support, stability and surface room than a bed tray and can be adjusted to accommodate the height of your bed’s mattress with a base that slides under your bed along the floor for a close fit. A hospital overbed table is made specifically for use with a hospital style bed, but it’s important to measure the model you’re considering and your bed, checking clearance under the frame—many overbed table styles may fit even a hospital bed. The features most important to you depend on the types of activities you want to accomplish in bed. An overbed desk tray table with a flat surface is great for writing, eating or playing cards, to name just a few activities. 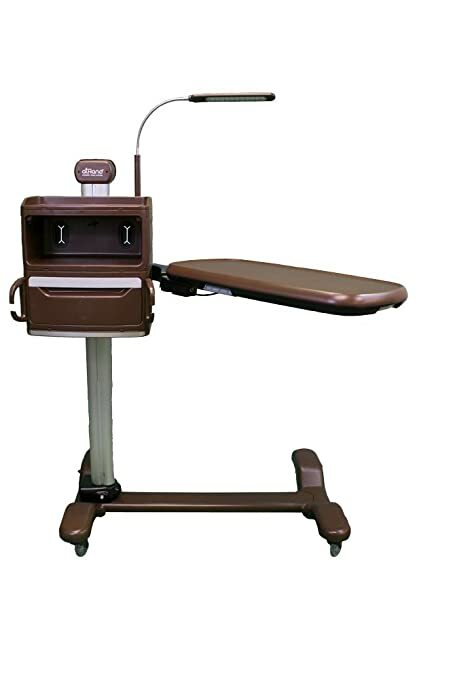 Reading is often easier with a tilt table—the tilt top overbed table surface enables you to angle your newspaper or book at the best level for your comfort. Some overbed tables offer part fixed and part tilting surfaces. The finishes, colors and textures now available in overbed table designs means your choice of overbed table can have more of the look of a piece of furniture than a medical accessory. An easy to clean top that’s roomy enough for the activities you’d like to engage in. Adjustable table height to accommodate the height of your mattress. Some overbed tables can be adjusted for use while you’re sitting in a chair, including a wheelchair, as well as in bed. The adjustment mechanism should be easily to use and lock into place. An adjustable pivot and tilt arm allows you to position the work surface to the height, angle and tilt best for your task, providing you with more versatility. With overbed tables that offer tilt positions, you might want to look for a style with a lip along the lower edge for holding your book, newspaper or a pad and pen. 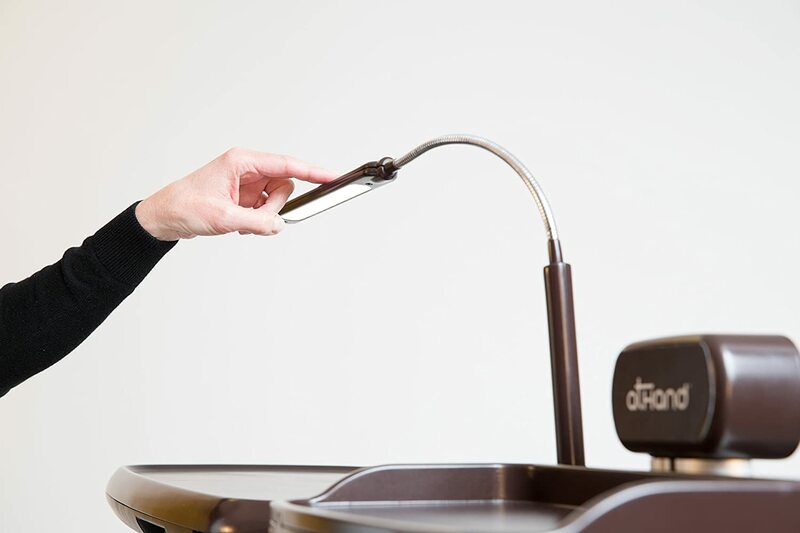 Take note of the weight limit that the tabletop surface can handle—usually between 40 and 50 pounds. 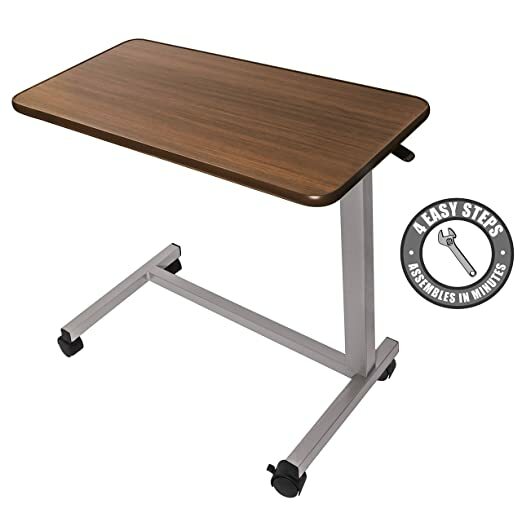 Standard overbed tables are not meant to provide support when getting up and down. Standard C-shaped or U-shaped bases have about 24″ of space between the legs to slide under chairs as well as your bed. Wheel casters offer for easy maneuverability over all floor surfaces. Locking casters on the base of the overbed table mean that the table will stay put once you position it. The atHand Overbed Table System is a very modern and feature-rich version of an overbed table. Usually in a hospital or a nursing home you’ll see standard overbed tables, but they’re very basic; they’re meant just as a place for the food tray or maybe some personal items, and they very easily get cluttered. Also, with the standard overbed table, you’re still left needing other things that the table doesn’t help with. 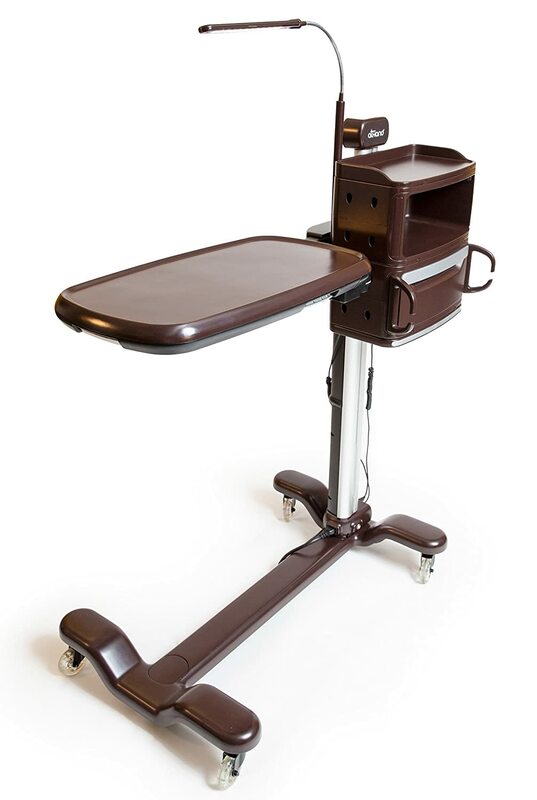 The atHand Overbed Table System was designed to incorporate all of the things that people feel they need and would like close-by if they have limited mobility. They did a lot of focus groups to find out what those items were, and that is why the table includes power and USB ports. 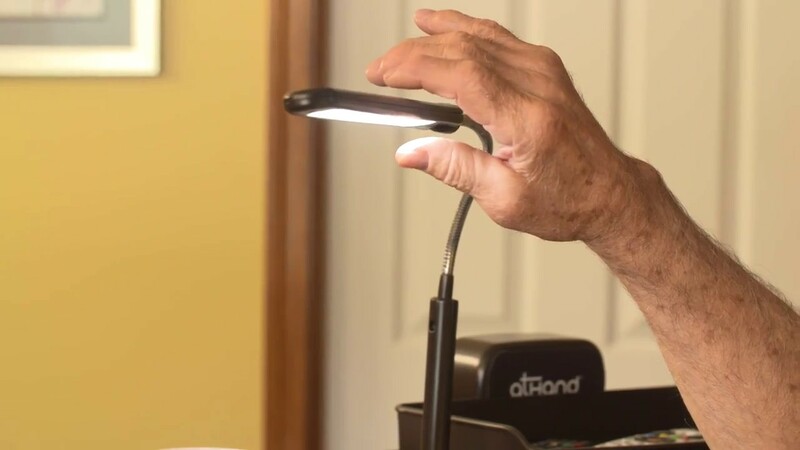 It also has integrated lighting that is adjustable in brightness as well as where you place it on the table. The atHand Table is height-adjustable, but it also angles in toward the user, so you can really get it up close to you if you’re writing or working on a laptop. In addition to all of those features, there are storage compartments, because that way you can still have all of your things, but they’re neatly organized and they’re not on the tray. There are also some great optional accessories for the atHand Table, like a special cup holder that keeps the drink close by, but off the table. There is also a bin for tissues, which is something everybody has near their bedside, but the box takes up a lot of room on the tray table. You can also purchase a trashcan because it helps with infection control to have the trash in a separate place, but, close by. The other thing is it’s a very nice looking overbed table system. I have to tell you, it’s a lovely piece of work. I wouldn’t mind having this in my bedroom. According to the company’s focus groups, something that came out loud and clear was, if I’m out of the hospital, I don’t want to be reminded of when I was in the hospital. That’s why they chose darker, richer colors because those are something that you’re not going to see in a facility. It does have a homier look. 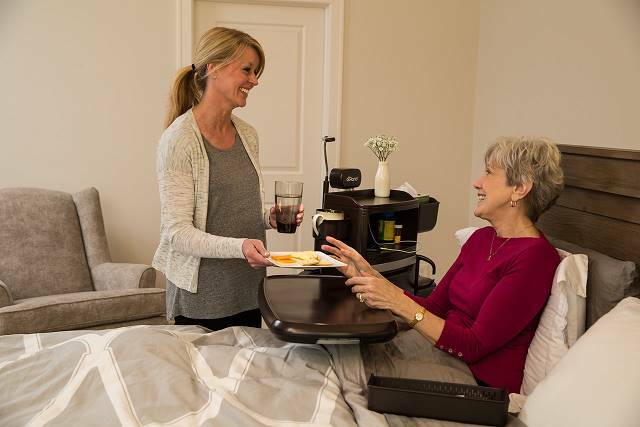 For caregivers, the atHand Overbed Table System makes their life a lot easier; the power outlets in particular because older homes have fewer outlets and most of the time they’re going to be lower to the floor or behind furniture. There is one power cord that attaches to the wall, which then powers the table with four, 120-volt outlets, and four USB ports. I’ve heard stories of caregivers that have kind of pieced things like this together. They have a power strip looped over the headboard and a TV tray table next to the bed. Peace of mind is everything for family caregivers. I think that the biggest challenge, when you’re at work or away from your loved one, is they could fall out of bed reaching for something, or just have to make moves that aren’t appropriate for them. Caregivers often feel bad that they can’t always be there for their loved one because they’re probably managing a career and children of their own, and don’t have as much time as they would like to be with their loved one. So, if this product can help give the caregiver peace of mind, knowing that their loved one has everything they need to last them through the day, then that goes directly to the purpose that an overbed system should have. And of course, for those in bed, it’s a terrific aid to independence, allowing them to do simple things without having to rely on a caregiver. You can see this manufacturer really researched to try to come up with a way to fit everything within reach. And you don’t have to actually be in a bed to use it, because the tray table angles toward the user. You can use it next to a recliner, even if it’s one of the larger ones where the tray table may not fit underneath the chair. 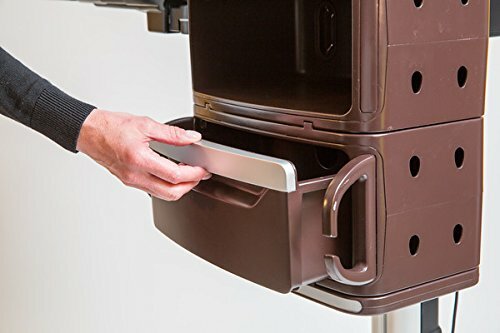 If you have it alongside the chair and the tray table angled in, it still fits nice and close so you can use the tray table as a desk or for whatever you need. The atHand Table is manufactured in the Cleveland area, but sells nationally on Amazon . Should You Consider a Hospital Bed for Home Use? Can the table also go on the left side of the bed? Yes, you can choose either the right or left side option. Left and right, plus back or brown options are available on the product page at Amazon.